Check out the article about The Sleep in Cincinnati’s CityBeat. Thanks so much to C.A. MacConnell! Click this link to check it out. We welcome your thoughts in the comments below! Also just released on iTunes is Never In A Million Years, the debut album by new, moody Cincy-based Electronica trio The Sleep. The band consists of singer Laura Smith, Neil Smith on keys, synths and electronics and guitarist Dave Eberhardt, who has performed with the late Katie Reider and singer/songwriter Holly Spears. The sound of the album is very 4AD, with ambient, airy soundscapes, a dash of psychedelica, excellent, diverse guitar work and Laura’s breathy, ethereal vocals. If you dug the recent M83 album Saturdays = Youth or were a fan of Dead Can Dance and Cocteau Twins, you’ll find The Sleep’s dreamy sound incredibly mesmerizing. You can find a preview of the album on The Sleep’s MySpace page: myspace.com/thesleepmusic. A free album booklet — with liner notes and lyrics — can be downloaded at the band’s official site. The album will be available soon at other online music-buying outlets. 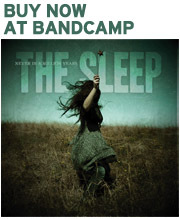 Never in a Million Years, the debut album by The Sleep, is now available for purchase at iTunes (US and UK). Also coming soon to Rhapsody. Want lyrics and liner notes? Click here to download the free Never in a Million Years digital booklet. The Sleep’s first – and free – single “Again and Again” was featured as a Daily Dose on Insomnia Radio.